which is viewed through an orifice or a magnifying glass. the Midway Plaisance of Chicago's Columbian Exposition 1893. The World's Most Beautiful and Liberated Ladies. 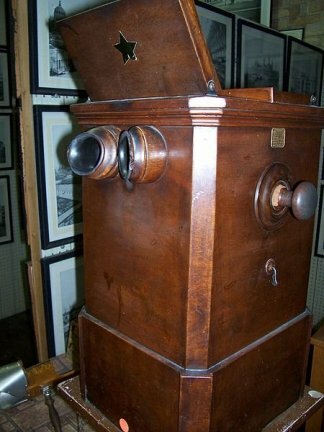 We invite you to enter and sample our Auto-Stereoscope. 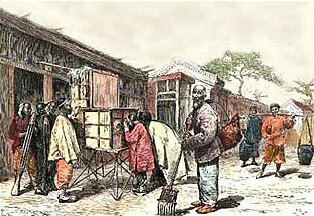 display a series of stereoview cards. give a spectacular illusion of three dimensions. are collated in four daring themes. 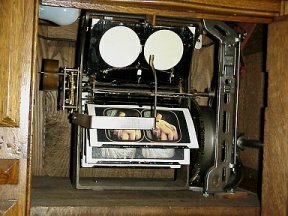 sequentially displays the stereoview cards. Our wooden cabinets are of ornate and well-constructed design. Our machines are set up to accept pennies. 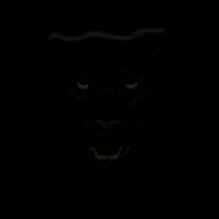 Many of our competitors will charge you a nickle per view. !! !JUST ARRIVED FROM PARIS, FRANCE!!! of Over 500 Titillating Post Cards! The most exciting entertainment invention of the century! 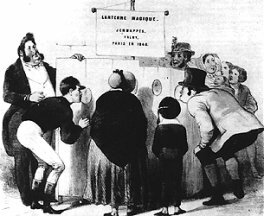 The Mutoscope -- manufactured by the American Mutoscope and Biograph Companies -- works on the same principle as a "flip-book." The individual image frames are conventional black-and-white, silver-based photographic prints on tough, flexible opaque cards. Rather than being bound into a booklet, the cards are attached to a circular reel. 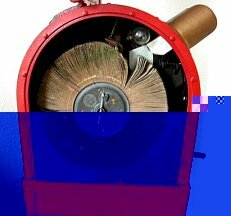 The reel holds about 850 cards, giving a viewing time of about a full minute. The reel with cards attached has a total diameter of about ten inches. Our Mutoscopes will be coin-operated. 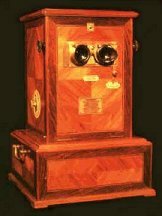 The patron will view the cards through a pair of lenses enclosed by a hood, similar to the viewing hood of a regular stereoscope. The cards are lit electrically, but the reel is driven by means of a geared-down hand crank. 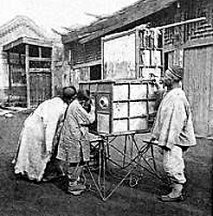 Each machine holds a single reel and is dedicated to the presentation of a single short subject, described by a poster affixed to the machine. The patron controls the presentation speed but the crank can be turned only in one direction, preventing the patron from reversing and repeating part of the reel. The patron is advised that stopping the crank or slowing it too much will throw the images far enough out of focus to blur them beyond recognition. 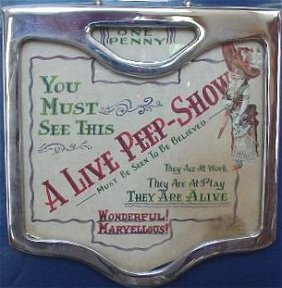 Copyright 1893: Columbian Peep Show Co.
Ed's Tour IV Ed's Tour V Ed's Tour VI Souvenirs. Pt. 2 Hillman Victorian Xmas Card Pt. 3 .